AIQ: How People and Machines Are Smarter Together [Audiobook] | Free eBooks Download - EBOOKEE! Posted on 2018-08-04, by perica123. Nick Polson (Author, Narrator), James Scott, Walter Dixon (Narrator), "AIQ: How People and Machines Are Smarter Together"
From two cutting-edge data scientists comes a fascinating audiobook that tells listeners what they need to know in order to understand how intelligent machines are changing the world and how we can use this knowledge to make better decisions in our own lives. Dozens of times per day, we all interact with intelligent machines that are constantly learning from the wealth of data now available to them. These machines, from smart phones to talking robots to self-driving cars, are remaking the world of the 21st century in the same way that the Industrial Revolution remade the world of the 19th century. 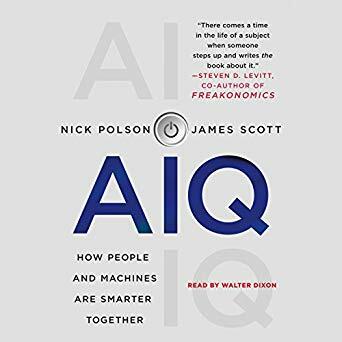 AIQ, by Nick Polson and James Scott, is based on a simple premise: If you want to understand the modern world, then you have to know a little bit of the mathematical language spoken by intelligent machines. AIQ will teach listeners that language - but in an unconventional way, anchored in stories rather than mathematics. Listeners will meet a fascinating cast of historical characters who have a lot to teach about data, probability, and better thinking. Along the way, listeners will see how these same ideas are playing out in the modern age of big data and intelligent machines - and how these technologies will soon help them to overcome some of their built-in cognitive weaknesses, giving them a chance to lead happier, healthier, more fulfilled lives. No comments for "AIQ: How People and Machines Are Smarter Together [Audiobook]".